We’d like to know a lot more than we do about how planets create magnetic fields. After all, a major motivation for exoplanet research (though hardly the only one) is to find out whether there is other life in the universe. A magnetic field can protect planetary atmospheres from the effects of the host star’s stellar wind, a stream of charged particles that could disrupt life’s formation. Planets in close orbits of a central star are going to be particularly vulnerable. But if protecting a planetary surface as well as keeping its atmosphere intact are powerful factors in understanding its evolution, learning more about planetary magnetic fields isn’t going to be easy. Consider a new paper from François Soubiran (École Normale Supérieure, Lyon) and Burkhard Militzer (UC-Berkeley). They’re digging into the question of magnetic fields on super-Earths, in this case planets up to three times the mass of our own world. The scientists believe that magnetic fields could emerge here, but in different ways than on Earth. 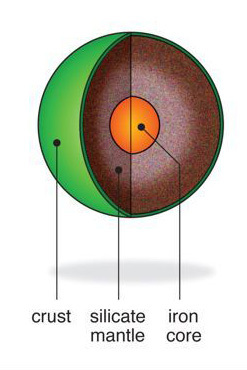 The density of some super-Earths, calculated by reference to known radius (from transit studies) and mass (from radial velocity investigations) implies that they are largely made of silicates. While we cannot know with certainty, modeling indicates that their interiors are probably much hotter than Earth’s and reach higher temperatures. The presence of large and persistent magma oceans in their mantles is likely. The question is, could such magma oceans in a state of constant churn generate the dynamo that would produce a magnetic field? 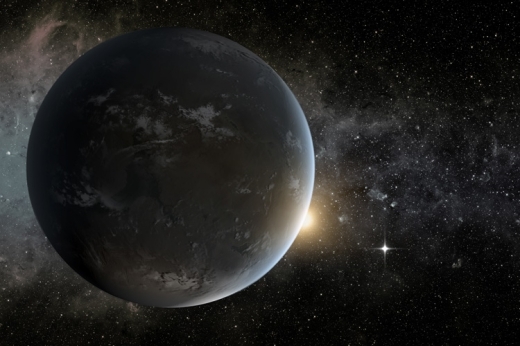 Image: An artist’s concept of a super-Earth in the habitable zone of a star smaller and cooler than the sun. Such large planets could have long-lasting magma oceans that generate magnetic fields capable of protecting incipient life. The graphic was created to model Kepler-62f, one of many exoplanets discovered by NASA’s now inoperable Kepler space telescope. Credit: NASA Ames/JPL-Caltech/Tim Pyle). On Earth, we locate the processes that generate the magnetic field in the molten-iron outer core, where in combination with the planet’s rotation, churning, electrically conducting liquid iron creates the needed dynamo. But between the core and the Earth’s crust is a mantle of silicates, the silicon-based materials that make up our planet’s interior. The researchers believe layers of material in the mantle of the early Earth may once have produced a convecting magma ocean and a magnetic field, one in place as long as enough material in the mantle remained liquid and convecting. In the case of super-Earths, the same process could be in play, with the massive scale of these planets keeping their own mantles liquid and convecting for billions of years. The challenge is to test the theory, for working with silicates under conditions like these is, shall we say, problematic. We’re talking about internal planetary temperatures of 10,000 degrees Celsius and pressures up to millions of times greater than atmospheric pressure at the surface. Thus the new paper, which recounts the results from the researchers’ modeling of minerals — quartz (silicon dioxide), magnesia (magnesium oxide) and a silicon-magnesium-oxide (post-perovskite) — at atomic scales, by way of making calculations of their conductivity. We learn that the silicates in question do become conductors as they make the transition to liquids at extremely high pressures and temperatures, enough so as to create a magnetic field. Image: Layers of a possible super-Earth. The heat of formation of such a large planet could keep its magma oceans active for a billion years, generating its own magnetic field in addition to the magnetic field produced by an iron core. Credit: NASA image. Based on this analysis and with the estimated properties of the silicates mentioned above, to have a dominant dipolar component, one would need to have a rotation period of the planet shorter than 2 days. Such a short period is incompatible with a tidally locked planet in the habitable zone of any star but could be achieved for non-tidally locked planets. Magma oceans on tidally locked Super Earths are thus likely to generate multipolar and not dipolar magnetic fields. The authors believe that a multipolar magnetic field would be that much more difficult to detect, though the paper does not go into detection methods. And things get more complicated still: While a magnetic field could emerge from a magma ocean alone, interactions difficult to predict are also possible between that ocean and a liquid iron core. What the paper gives us, however, is a calculation of high temperature and pressure conductivity of liquid silicates, showing that with enough convection, they can be conductive enough to support a magnetic field. The paper is Soubiran & Militzer, “Electrical conductivity and magnetic dynamos in magma oceans of Super-Earths,” Nature Communications 9, Article 3883 (2018). Full text. that imply that any plate tectonics would be accelerated? on such worlds are colliding every 20-30Mya cycles due to their convecting mantles, subducting in places and violently creating new landmass in others. It would certainly be challenge to any lifeforms to have to face such a large and fast changes to it’s native continent. if it be only on a scale of 20 – 30 Megayears I feel confident saying it would be no obstacle for life as we know it to adapt to such timescales. Remember that large areas of the northern hemisphere repeatedly get covered in ice, and that life simply move back and forth, colonize new areas and adapting. Even the relatively short period between the ice ages do change. After the last ice age there were more CO2 in the air, and initially a much warmer climate 2-3 degrees average higher temperature. Luckily this was offset by a lot of remaining ice that provided cooling, and reflecting sunlight out to space. On even shorter timescales we can see how fast life colonize recently created volcanic islands in the ocean. The larger the molecule, the more easily its structure and thereby its function is disrupted. Regardless of how similar or dissimilar to our molecular biology an alien life form might be, it would need protection of its cellular machinery from the discuptive effects of radiation; such protection would be one of the prerequisites for the emergence of biological life. I agree. With regards to magnetic fields, they primarily shield the planet from charged particles, and secondarily help retain an atmosphere to moderate surface level EM and high energy cosmic radiation. Over the long term, the retention of an atmosphere is probably the most important, as this also ensures the retention of an ocean. Water is very good at shielding all types of radiation and therefore allows life to survive even harsh condition at the surface. The question I have is whether a super-Earth needs this magnetic field to retain an atmosphere. If the gravity is higher, it should reduce atmospheric loss. We also have the case that Venus has retained its dense atmosphere without a magnetic field, which perhaps calls into question whether magnetic fields are really needed. I suspect the issue is that we believe that loss of magnetic field during Earth’s periodic field reversals allows charged particles to reach the surface, creating a hazard to surface dwelling, primarily large, multi-cellular organisms. Organisms living underground (as we might on the Moon and Mars) should be relatively unscathed, as would organisms living in the oceans well below the surface. If there is life in Europa, the surface ice layer will protect it from the fierce radiation around Jupiter and its magnetic fields. I also think that life would adapt to higher radiation levels, just as some terrestrial organisms are quite radiation resistant. No doubt sometime in the future we get a handle on the impact of magnetic fields and the presence and nature of life on exoplanets. Very good point about Venus. It’s closer to the Sun than we are, receiving 1.9 times our solar flux; it’s 0.8 Earth masses and so has a surface gravity of 0.9g; and it has no intrinsic magnetic field. Yet it has one hell of an atmosphere – surface pressure is 50 times that of the Earth’s. It’s interesting to compare with Mars – 0.43 relative solar flux and 0.38g, mean surface atmospheric pressure just 0.006 of Earth’s. I’m not sure we have a model of atmospheric retention in terms of solar flux and g that explains these differences, let alone throwing intrinsic magnetic fields into the mix, but I guess Venus and Mars show magnetic fields aren’t significant in atmospheric retention (though of course still important in stellar wind shielding). The atmosphere of Venus is approximately 100 thicker than Earths. I feel magnetic fields are over rated. Can’t help but disagree. Look at Mars, for example. It once had a massive ocean, but it lost it and most of its atmosphere too precisely due to to the lack of a planet wide magnetic field. The fact that Venus still has a massive atmosphere tells us that CO2 is a more radiation resistant molecule, not that magnetic fields aren’t needed. Planets might not be able to hold onto gas and liquid water without them. A possible means of removing Mars atmosphere and highly likely is asteroid impacts. The energy released from impacts is much more effective at removing gases on low mass worlds, there is also an asteroid belt nearby. The atmospheres of Venus and Mars are both 96% CO2. Both planets seem to have lost their intrinsic magnetic fields within the first 1bn yrs. The atmosphere of Venus is 14,600 times thicker than Mars, despite it receiving 4.5 times the solar flux. Venusian escape velocity is 10.36km/s, Martian 5.03km/s. These figures don’t make any sense to me, but they are unarguable facts. I’d like to know what the habitable zone of Venus around the Sun is and likewise what it would be for Mars, as a precursor to a more general theory of stellar flux against planetary escape velocity, but I don’t think there’s any scientific consensus around this, even without adding magnetic fields (which clearly not all planets may have). And Venus may well have had a magnetic field in the past, before runaway greenhouse removed all its plate tectonic lubricating water and then stellar induced tidal forces within its resultant thick atmosphere forced down its rotation towards the synchronisation with the Sun we see now . Thus the biggest driver for a magnetic field was removed. There is still likely a convective outer core, as with Earth, but with its “stagnant lid” crust ,Venus lacks mantle convection and with it critical heat transfer across the core mantle boundary .So the alternative pathway to some sort of field desribed in the article above is removed too. At just 0.1Me ,Mars is too small to have had a long lasting large convective core or enough radioactive isotopes in its mantle to create major or long lasting convection there either . To small to hang onto a terrestrial atmosphere too ,for more than a couple of billion years at most anyway , especially after it lost what little magnetic field it had and the Sun brightened with age . If Mars and Venus had swapped positions things might have been very different mind, for Venus certainly . Shame. Many simulations of the early solar system and its migrating giant planets , end with the formation of a large terrestrial (1-2Me) planet around Mars’ orbital position . OK, done some reading and calculations. You’re right about Mars – but if the escape velocity was just 5.8km/s instead of 5.0km/s, it would retain water and other key components of a terrestrial atmosphere. Assuming unchanged Martian density, this would be at just 0.16Me (instead of 0.107Me). So unlucky for the Martians, I guess. I think with or without a magnetic field, the orbit of Venus is too close for a HZ, whatever a planet’s size. As you speculate, had Venus been swapped into the orbit of Mars, things would have looked very different – and perhaps a super-Earth with a thicker atmosphere and more greenhouse effects could extend the HZ further out still. To hold onto ( but not create ) an 02 rich terrestrial like atmosphere , in his “Habitable planets for man ” Stephen Dole calculated a minimal required mass of 0.25 Me . Assuming similar elemental content , that’s about 0.57 Re with a gravity about 0.5 g. He comments that this is likely too low ,with a figure of around 0.4 Me more realistic , 0.77 Re and 0.64 g.
More interestingly still , he also calculated an upper mass of about 2.34 Me, 1.25 Re . Based on a 1.5 g gravity field , after which he posited that Hydrogen and helium would begin to build up in sufficient quantities to create what would become known as a “mini Neptune”. A thick primordial gas envelope anyway . This calculation almost exactly matches Chen and Kipping’s 2016 observational findings. Over fifty years later. Incredible . Well worth a read even now. Available for free in PDF format on line. Multipolar magnetic fields. That’s the key. The theory of Dipolar magnetic fields being created by a combination of outer core/mantle convection in planets rotating in less than two days is nothing new. To protect an erstwhile atmosphere it is not just the field strength per se as much as the planetary “stand off” distance of the resultant magnetosphere. For potent Earth like dipolar fields , incoming high energy stellar radiation and particle storms are diverted towards to just two points – at the poles – the closest they get to interacting with the planetary atmosphere. For Earth this generally just results in ephemeral Borealis storms though for more agressive stellar fluxes it could result in atmospheric erosion. For multipolar fields, even if potent , there will be multiple points across the planet where the magnetosphere stand off is pushed down to the lower atmosphere or even the planetary surface. Leading to atmospheric erosion irrespective of the field strength. But there are still a lot of unknowns about what goes on in the core and mantles of big terrestrial planets . The density of the mantle and it’s make up is still largely unknown and convection at the core/mantle boundary , irrespective of the physical status of the mantle itself, seems to play a vital role determining the nature of any planetary magnetic field . Some models have shown that outer liquid core convection alone can cause dipolar Earth like fields that might be strong enough to maintain the planetary magnetosphere stand off distance clear of the atmosphere. Many don’t. No observational science , so it’s very important to recognise that all this work is based entirely on simulation. How would the large salt oceans on large tidally locked planets around M dwarfs be able to generate magnetic fields? The currents created by the strong magnetic field of the the red dwarf and the fast orbit the planet around the dwarf may setup a large Magneto-hydrodynamic (MHD) planetary magnetic field. The deep salt oceans also could have other ions in it besides sodium from the convection with the mantle that may intensify this. The other effect could be strong currents generated by the large temperature gradient between the day and night sides. Could MHD be active in the highly ionized day-side atmosphere of planets like in the Trappist one system also? So apparently many superearths are assumed to have much more Si to Fe than Earth does. Why might that be? I would have thought that due to widespread mixing of the interstellar medium that most systems would start out with basically the same elemental percentages as ours did. The interstellar medium is far from homogenous and varies substantially according to position in the Milky Way. The active galactic core for instance , versus the ancient & indolent galactic disk , versus even more ancient and “static” globular clusters and halo stars . The ages of the local stars determines their make up . Each successive wave of stellar death via supernovae and consequent star birth , enriches the interstellar medium with increasingly heavy elements . And very different radioactive elements with different half lives impacting on internal planetary heat production. A veritable diaspora . Younger generation Type I stars will thus be much more enriched versus surviving older generations , as will their resultant protoplanetary disks and finally their planets. It follows that this is likely to lead to very different mantle mineral contents , and radioactive elemental make up in exoplanets about the Galaxy across both place and time. Nice reply Ashley, thanks for answering. The points you make seem to insure that no two planets will be exactly the same as far as elemental abundances are concerned. Should lead to endless variety. If the Curie Temperature is the boundary between ferromagnetic behaving materials and the materials at lower temperature than Curie temperature have magnetic fields, then why wouldn’t super earths not have magnetic fields if there are regions of cooled iron within? One reason I bring this up is that there is no mention of Curie temperature above. Then given you have a magnet, the EM current induction is due to oscillation with respect to another magnetic field. That’s where orientation and rotation rate come into play, I presume. It seems that formation of a net dipole in an outer spherical shell laced with iron veins would be the basis for the terrestrial or super earth magnetic field and its intensity. And then another naive reason I would think that magnetic fields are near the surface is due to the high temporal rate of change of the pole’s orientation. Your magnetic compass setting over the years can get out of date. I would maintain that the convection of molten interior materials is what changes the shape of the magnetic field, creating new liquid flows that eventually freeze, melt and flow again, etc. And if the overall pole of the field oscillates due to offset with respect to the rotational axis, there is a an induction current. Synchronous rotation of a super earth with a primary would put a crimp in that picture, true, but we are talking about super earths in general, right? Mars obviously has substantial iron exposed to its surface, but does the overall magnetic content have an organization similar to Earth’s? How deep do you have to go before you reach an iron core? Being less dense, it must be a ways. I may be off the mark, but if you have fissures in the silicate crust of a super earth, there should be a flow of iron core fluid, a gusher of some sort, and then a region where things cool and recycle. If there are plate tectonics or overall convective interior churning, then the magnetic field should change its shape. The remaining issue seems to be synchronous rotation with a primary. Well, in the discussion of decay to synchronous rotation, I would wonder if ocean worlds might have a counter mechanism. Depending on heating on one lit side and polar ice forming on the other (dark), there would be a non-uniformity in the spherical outer shell of a planet synchronized. It might even struggle between oblate (rotational) and prolate ( planet sun line) build ups. Maybe an indicator of geological eras when the trends interfere and crumble? Even when the discovery of the TRAPPIST-1 system was discussed, I proposed a method for detecting habitable planets by a combination of two features – an oxygen atmosphere and a strong magnetic field. Then there should be Aurora with the corresponding lines of ionized oxygen. Astronomer Boris Shtern then confirmed that in principle it is possible. Now the sensitivity of the devices is higher, especially since we are talking about super-earths. You can try to look for such signatures. aurora? The first question, I don’t know. The second, the answer is yes. So apparently the CO2 or another large oxygen molecular source breaks down? Anyway,maybe a spectroscopic observation would detect the aurora at Trappist 1, but the source could be a slow rotator without a mag field or free O2. Like Venus. This article is a Free fly of human fantasy (or opened mind), no more. Wandering how someone can build and check his models if hi knows almost nothing about modeled object? For a planet to create a magnetic field, there has to be more than just a conductor, but motion and convection in the mantle is too slow. There has to be a fast rotation since charged particles moving in circles or electrons create a magnetic field which is why a planet with a strong magnetic field has to have angular momentum gained by a collision with a large body or bodies. Gas giants gain angular momentum from in an accretion disk of the gas giant and also the solar system. Next post: Slowing Star Formation: A Key to Astrobiology?